Members of Tasmania’s Devonport Horsehead Water Ski Club set a new world record for the most people towed at once by a single vessel. 114 people crossed the line at Strahan on March 28, beating a 24 year old record by Cairns & District Powerboat and Ski Club, when 100 skiers crossed the line. 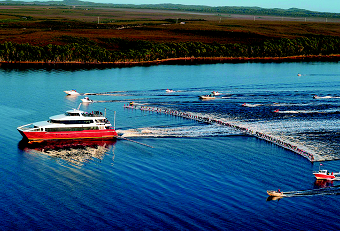 Incat Crowther, which supplied the 36m tourist powercat that towed the skiers, said plans are underway to attempt to stretch the record even further, with some Horsehead members believing they can achieve as many as 150 skiers. Visit www.skirecord.com for more information.